Breaded and baked cauliflower florets tossed in a spicy sauce. 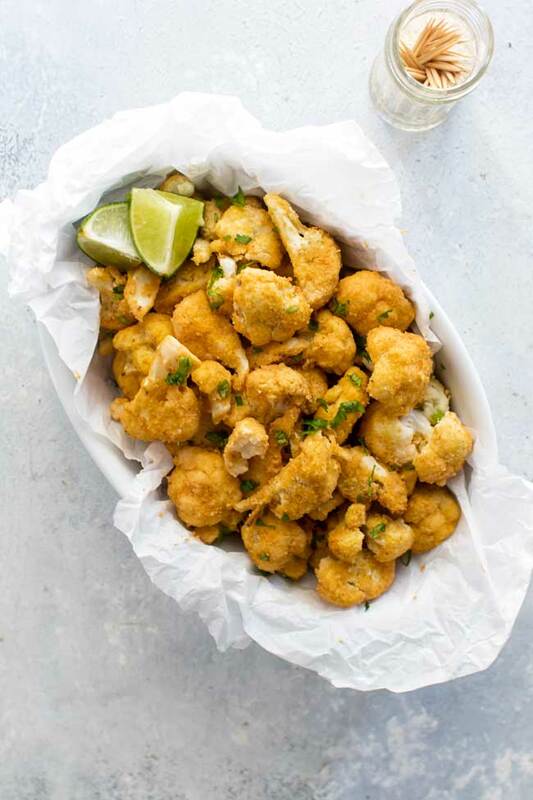 These sriracha-lime cauliflower bites are an addictive appetizer! The inspiration for these bites came after a family get-together at a restaurant called The Roost when, with amazement, I watched even the most cauliflower-hating diners at my table go ga-ga over an appetizer called “bangin’ cauliflower”. After a little investigating, I learned that the cauliflower florets were first lightly battered in a tempura batter, quickly fried, and tossed in a light sriracha-lime sauce. The end result was a bowl of addictive spicy cauliflower bites. And so, as is my way, I wanted to try out my own version but without the hassle of battering and frying the cauliflower. 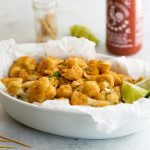 My version is a breaded and baked nod to the original and with football season upon us, there’s no better time than the present to update our appetizer repertoire with a new spicy treat to pass around at get-togethers. There are a few steps including breaking down a head of cauliflower into florets, tossing the florets in some whisked egg, coating them in breadcrumbs, and baking them until the breadcrumbs are crispy and the florets are tender. I found it was easiest to coat the florets in the egg and then use a fine mesh sieve to drain the excess egg. Use a bowl to catch the excess egg like in the photo above or, as I did when testing the recipe, hold the seive over the sink. I also found it helpful to prep the florets in two batches coating only half of them with egg and then transferring them to a resealable bag with only half of the breadcrumbs. Do a quick shimmy-shake and toss, toss, toss until the florets are evenly coated. Transfer the breaded florets to a baking sheet lined with a baking rack. This allows the heat to circulate around the florets while they bake. Place the rest of the breadcrumbs in the bag and repeat the steps (including the shimmy-shake, toss, toss, toss) for the other half of the florets and from there you bake them in a hot oven for 25 to 30 minutes. Most notable about the original appetizer we had at the restaurant was that the cauliflower wasn’t crispy despite the deep-frying. The florets had a soft texture since they were tossed in the sauce after they were fried, which led me to mistakenly think they were just roasted and tossed with the sauce before I learned otherwise. I tried a version with no breading but, without the coating, the sauce didn’t have anything to cling to and the result just wasn’t the same. The breading is a vehicle for the sauce and adds some much-needed texture. And the sauce is simple to make. Whisk some lime juice, sriracha, and a touch of mayonnaise together and that’s it. Unless you have a giant bowl, I recommend dividing the sauce and tossing it with the breaded cauliflower in two batches to make things easier. Because the sauce is thin the breadcrumbs will quickly absorb it so it’s best to be fast and skip the shimmy-shake and just toss, toss, toss. 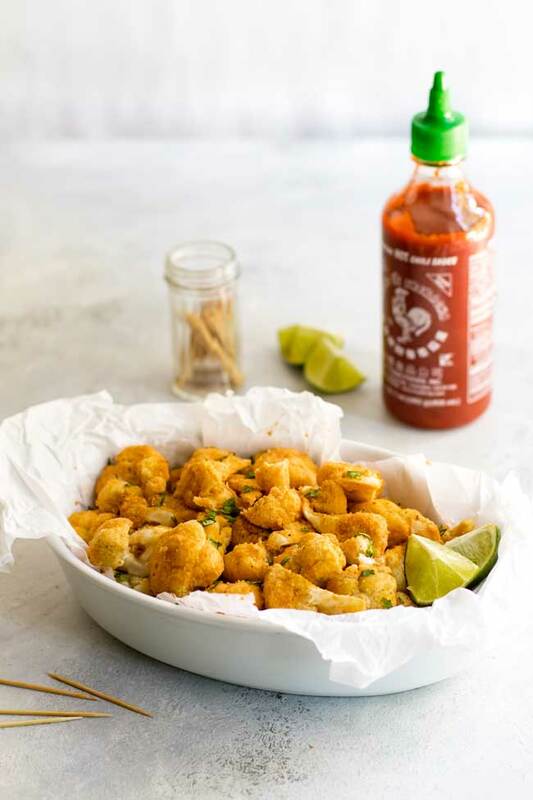 These sriracha-lime cauliflower bites are best served right after you toss them in the sauce. Pile them in a serving dish and pass them around with some toothpicks. I can promise they won’t last long. Preheat the oven to 425°F. Place a 1/4 cup of breadcrumbs in a large resealable bag and add half of the salt. Crack the eggs into a large bowl and whisk them until the yolks and whites are completely combined. Place a baking rack on a sheet pan. Take half of the cauliflower florets and place them in the bowl with the whisked egg. Toss them with the egg until they are coated. Scoop them into a fine-mesh sieve or colander (I did this over the sink), reserving the extra whisked egg in the bowl, and let the excess egg run off. 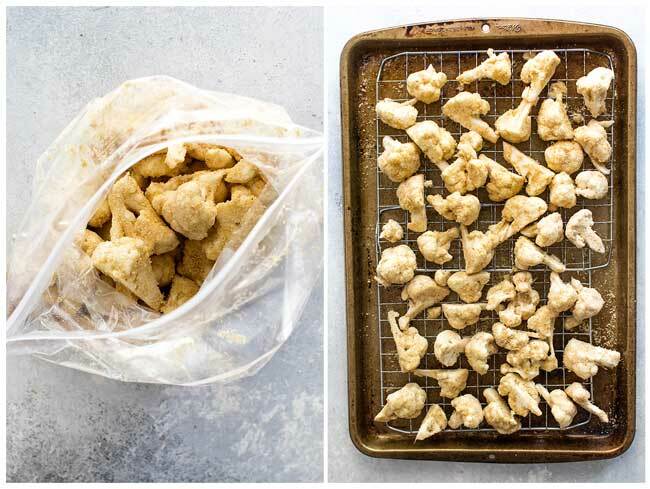 Transfer the cauliflower to the bag with the breadcrumbs. Seal it and shake the bag until the florets are evenly coated with breadcrumbs. Place the florets in an even layer on the baking rack on the sheet pan. Pour the other half of the breadcrumbs into the resealable bag along with the rest of the salt and repeat the same egg and breading process with the rest of the cauliflower florets. Once all of the breaded florets are on the baking sheet, lightly coat them with a few sprays of cooking spray. Bake the florets for 25 to 30 minutes or until the breadcrumbs are browned and the florets are fork tender. While the cauliflower bakes, make the sauce. In a small bowl, whisk the lime juice, sriracha, and mayonnaise until combined. Remove the cauliflower from the oven. Let them cool for a couple of minutes. Transfer half of the sauce to a large bowl. Place half of the florets in the bowl and, working quickly, toss them with the sauce. Add more sauce to the bowl and repeat with the rest of the florets. 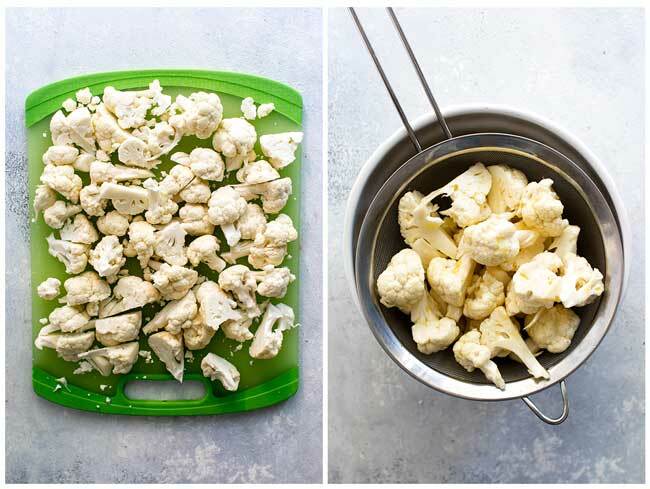 Place the cauliflower bites in a serving dish and serve immediately.